To provide the village the status for Yorkshire in Bloom encouraging local people to plant flowers and shrubs and to help with environmental issues. It has come to our notice that many residents have shown an interest in re starting the Haworth In Bloom program. Both the Parish Council and the Haworth Village Trust would like to work in partnership to re kindle the enthusiasm and competitive spirit that won our village many awards in the past. Many of you will know Steve Thorpe who, as asked by the Parish Council, has been valiantly caring for the planters around the village since the previous group was disbanded. Steve would like the Village to enter the Villages in Bloom contest again this year and is willing with help to do the paperwork involved. With the Tour de France, Grande Depart on the horizon, plans for planting are already underway but help is urgently needed to keep us on track. Encouraged by the Parish Council’s Environment Working Group the Friends of the Park have been asked to help form a new group to work with Steve and the Parish Council to take this program forward. The Park is a vital part of the In Bloom contest but a separate group is needed to maintain the beauty of the whole of our unique village. A meeting has been arranged at The Old Hall on Tuesday January 14th at 7pm to discuss what needs to happen next to move this project forward. Please come and give us your support and spread the word to encourage others. If you were a member of the previous group and would like to be involved again, please come, your previous experience will be invaluable to us. Haworth Village got Silver Gilt at the Yorkshire in Bloom awards. The busy tourist centre of Haworth is a pleasure to visit, residents work hard to enhance the village for everyone, both local and visitor. The appropriate planting adds to the appearance of Haworth without overwhelming. The council led improvements to Central Park have encouraged the community to think big and the possible reintroduction of the bandstand are definitely worth waiting for. The primary school again innovates and leads the way with many examples of best practise. It continues to be a pleasure to witness the enthusiasm in which they complete all their projects. Central Park’s improvements are very evident and further plans will further enhance this asset to the town. Colourful hayracks & baskets in the main pedestrian areas add impact. Allotment sites are both productive and well kept. Some planters and street furniture is looking a little tired. The school wildlife area at the Bronte Parsonage was very commendable. There is a problem with weed control throughout the whole entry. In key areas in really does detract from the entry. The links established by Haworth Primary School with the community. The very evident support of both Metropolitan and Parish Council Support. Photographic evidence of the year round work of the bloom group volunteers would reinforce the entry. 2009 Silver Gilt, 2008 Silver Gilt, 2007 Double Gold, 2006 Silver, 2005 3rd, 2004 5th, 2003 7th, 2002 9th. deducted to cover the £50 entry fee to 2009 Yorkshire in Bloom, and £100 to pay for spring plants ordered. Inn, so they could be more publicly seen. The Old Hall to be asked if this is possible. The Council had been contacted with a view to finding out if any funding had been allocated to our 2009 entry, it was reported that money was tight but a sum of money had been allocated, although there had been some objections to the amount we had been allocated in the past as compared to Crossroads, the amount is yet to be conveyed to us, and will not be available till at least mid-to late April. They are to judge ourselves and Addingham. Jason Boom rang us and gave us 2 dates for the Spring judging which were 14th or 15th April in the afternoon. It was discussed, with some concerns that this was Easter week and people would be on holiday and the School closed but the alternative week given would have been end of March which would not have given much time to get everything prepared, especially as the new planters were to be done for the Spring judging, so it was agreed that the Tuesday, 14th April, 2.00 – 4.00pm was the best option. This had been renewed at a cost of £53.49, it was asked if the committee felt this was necessary, all felt it was as it included personal liability insurance which covered us should there be an accident to a member of the public. This is to remain more or less the same as 2008 but as there was not a lot to see at the Ebor Lane nature reserve this would be pointed out but not stopped at. Regarding the church areas, there would not be much colour there as the daffodils had not come up very well this year, and the lovely display of snowdrops would not be there when judging takes place, photos are to be taken of these and explained that Anthony Med who looks after these areas is trying to get a collection of snowdrops together which all thought a good and unique idea to put to the judges. It was decided that the remaining sleepers would be used to replace the existing three hexagonal planters which are virtually in ruin, having most panels kicked in and one of the planters had to be held together with a piece of wood as it was falling apart. This is to be done on Saturday, 21st March, weather permitting. The remaining planters to be stained up to hopefully push them on a while longer. A letter had been sent to the Council to add Haworth in Bloom to the list of allotment applications, and to request that people who have already an allotment allocated be pushed to keep this to a certain standard and if not be asked to surrender this, as apparently the waiting list is long with people being on this for years to no avail. A letter was received back from the Dept of Regeneration who stated we would be put on the waiting list and that all allotments are inspected annually, which the meeting felt was ridiculous bearing in mind the state of some of the allotments. They continued to say that the allotment budget was woefully inadequate but that once they were back under Parish control some of these issues can be addressed. At the present time Haworth Rec. Ground has 45 people waiting, with the time being approx. 2+ years, and the West Lane site has 67 names with waiting time approx. 5+ yrs. It was decided that it would be best to put a letter together to send to the Haworth Council requesting an allotment in readiness for them taking over the allotments if this was to be the case. The meeting did feel that the allotments were currently in a much better state and could be mentioned to the judges as part of the route. Mel Smith had been approached to see if we could use the park bench which had been placed in the park compound to replace the very shabby one outside the Old Hall, but Mel stated this was from the park and would have to be replaced but he would see if he could do anything. Peel Park to be informed of brighter coloured flowers to go in hanging baskets etc., a theme of ‘Long Hot Summer’ was given. Nos for hanging baskets to be determined and ordered. It was also decided to get the planters on the park gates made up by Peel Park this year and new ones are to be got so that these can be rotated between seasons and will give a much better visual impact, with the smaller ones being used for the winter/spring. A further supply of plants had been obtained and these need to be distributed around the planters and fill in gaps. Containers etc to be stained up. Old Hall volunteered to plant up areas around the commemorative plaque. Steve mentioned a grant could be obtained from Morrisons supermarket for community projects and this to be looked into. It was stated that Glen Miller, District Councillor may be able to come up with some funding for us, it was felt this was worth a try. This was an old tradition that had been done in Haworth and it was thought would be something different to look into as no one knew too much about it. It was suggested that butterfly pupa might be a different thing to try, but various objections to this were put forward and it was decided not to proceed with this. There being no further business the meeting terminated at 9.00pm. With its cobbled streets, industrial and literary heritage Howarth is a place visited by many tourists, who cannot fail to be impressed by the effort and commitment made to present a colourful and attractive town. This is an example to all of a YIB entry which is enthusiastically embraced by all ages of the community. 1. The progressive improvements being made in Haworth Central Park. 2. The continued excellent work being carried out by the school children at the primary school. 3. The completed landscape works at the medical centre. 1. Increasing the involvement of the wider community for further displays at strategic sites. 1. Church yard improvements which are developing well. 2. The number of small corner displays in a variety of containers which give all year round colour. 3. The charming garden at the Bronte Parsonage Museum. 1. 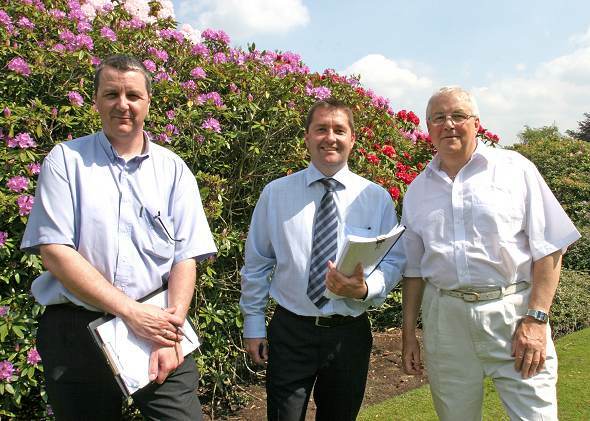 The Friends of Haworth Park could increase their working membership activities. 2. The inclusion of an allotment site on the route would expand the scope of the entry. 1. The tremendous efforts at the primary school to raise awareness and involve the pupils in environmental and sustainability issues is worthy of recognition. 1. Enhancement of the Mill Hey Recycling facility with a floral or landscape contribution and more signs and interpretation. 1. Haworth overall was clean and well presented and a credit to all those involved in the entry. 2. Continued involvement from the wider community in YIB and Hayworth.s entry. 1. Incremental improvements in the street furniture, particularly seats and benches through a strategic approach working in partnership with the local authority. 1. The enthusiasm and involvement of the primary school pupils. 2. The commitment and level of participation shown by the businesses and residents on Main Street. 1. Wider local publicity to attract even more participating residents and local businesses. This is to be held on Thursday, 17th July at 10.00am. Lacquered and hopefully completed by 14th July. The original 3 planters have been emptied, grouped, stained up and replanted and look excellent. Permanent planting to be bought for these, a discussion was held on this. remaining areas and this looks much better. The tubs are still to plant up. to put some plants in. Mel Smith reported that a recycling bin was to be placed by the park gates. (At the time of printing this has been placed. )All felt this was a very good idea. To contact Anthony Med to see if he requires any help tidying up the churchyard. It was planned for later in the year, that some further planters are to be put at the top of Mytholmes Lane. Jackie Thorpe thought it was a good idea for the scouts/guides to become involved with this and perhaps design their own and plant them up. All thought it an excellent idea. Linda stated she would do a leaflet to deliver, asking residents/traders to please ensure everywhere is looking as tidy as possible around their area. A leaflet asking for volunteers has been placed around Haworth i.e. in the Notice Board (by school) and in various shops, which hopefully may generate some new people to help with jobs and ideas. Double Gold for Haworth was a tremendous achievement at the Yorkshire in Bloom Awards ceremony in Hull. The village itself has been steadily improving every year since entering the competition, but to gain Gold Standard really rewards everyone's hard work and will hopefully encourage lots more people to join the small but very willing working party. It does not take too much time up, but more hands could really help us to carry on building on Haworth's success. Local businesses have once again supported the village and made the success a real team effort. For Haworth Primary School to win the Sir Richard Graham Youth Enterprise Award for the third year running and to gain Gold Standard once again is unbelievable. This is just reward for a group of absolutely brilliant young children who have not only found out about the love of gardening, but also about the love of giving to and helping other people. The award is so very special every year because there are so many new children coming into the gardening club each year, who have not experienced this great feeling before. I must admit my heart was pounding when we were waiting for the result to be announced. So much of our efforts this year has gone into sharing our work and ideas with other schools in Yorkshire and helping them to start and develop similar projects of their own. So to still win this major award with so much competition makes it so very special. We owe a big thank you for all the support and encouragement we are given by the community and to all the local businesses who help us with so many different projects. I think it is so important to keep developing our work, to keep the children interested and stimulated and to set ourselves new challenges. The historic village of Haworth sits high in the Pennines. There is an enthusiastic In Bloom team who are well supported by the community, local businesses and the Local Authority and it was clear to see that further enhancements had taken place since the spring judging. The Haworth Primary School Gardening Club is to be commended not only for their achievements within the school garden but also for the huge amount of caring community work they are involved with. The school is an example to all of how, by working with this age group, we can enhance our community and encourage our young people to become involved, thereby creating a better future environment for everyone. 1. The continued plans to improve Haworth Central Park and the creation of the Friends of Haworth Park group. 2. The colour theme and quality of plants along Main street, particularly the central area where the impact was impressive. It was good to meet competition winners and witness their pride in the achievement. 3. The variety and high standard of gardens throughout the village and in particular along Mytholmes Lane. The judges were pleased to meet the best kept private garden winner. 1. It is acknowledged that work in Central Park is part of a long term scheme of improvements, some of the bedding had suffered from the current weather conditions. 2. Continue to encourage businesses to become involved particularly at the top and bottom ends of Main Street. The Railway Station may benefit from further planting at the entrance. 3. Continue to encourage residents on main street to become involved. 4. It is hard to suggest further improvement, just to encourage the continuation of the support. 2. The improvements at the Bronte Parsonage Museum and the plants along Main Street, both have included a good variety of permanent planting in their schemes. 5. The planting undertaken by the young people who have incorporated sustainable plants into tubs, beds and borders. 1. It is hard to suggest future development in the areas visited, just to encourage more of the same. 3. The War Memorial is clean and tidy, however, it would benefit from some permanent planting. 4. It may be beneficial to encourage permanent planting in the car park areas of the town. 5. Continue with encouraging and involving young people in developing and planting sustainable areas around the town. 1. The Ebor Mill Nature Reserve is well managed and the plans to intensify and diversify the plant species will further enhance this area. 2. The school re-cycling programme is exemplary. Composting at the school and at the Bronte parsonage. 1. It will be interesting to see the results of the botanical survey that has just commenced at the Ebor Mill Nature Reserve and how that will help the new team from the Cathedral Centre looking after the site. 2. Continue to encourage young people in recycling initiatives. 1. Litter was not in particular evidence, which is impressive considering the high number of visitors Haworth attracts each day. Whilst dog bins were not in evidence, the area was almost clear of dog fouling. 2. The Friends of Haworth Park group is a huge benefit to the park. 1. It was clear to see that wide spread spraying had taken place. It may have been beneficial to have had a clean up once the weeds had died off. 2. It may be worth considering advertising a clean up day to pull out the dead weeds. 1. The media involvement, the In Bloom badges and banners. The website is easy to follow and user friendly. 1. The In Bloom group may benefit from a dedicated newsletter or consider putting planting tips on the website. 2. Encouragement of local businesses to sponsor planters or areas. Next Haworth in Bloom meeting is at the Fleece Inn Haworth Main St, Tuesday 20th June at 7:30pm, All are welcome. Contact Jackie Thorpe 01535 647496 for more information. 1. Would it be possible to develop a Friends Group to help look after and further improve the nature reserve. 2. Many areas could be sponsored and if they are, could this be demonstrated on the tour more? In this years Yorkshire in Bloom competition we have managed to get 3rd place! Well done to everyone who has helped make the village look so good. Last year we were 5th, 7th in 2003, 9th 2002 so we are getting better each year. Click on the thumbnail for more information. Summer judges visited Haworth for the final round of judging, the results will be announced in September. "The 'in Bloom' group and school garden club serve as an example of what can be done and achieved when children are involved. The garden club maintains some of the school grounds growing both vegetables and flowers. They have also started to develop a nature area and wildflower area. They also plant tubs at the Fire and Railway Stations. The main street now contains much planting either provided directly or funded by the commercial sector. Private gardens are generally limited in extent but well planted and well maintained." 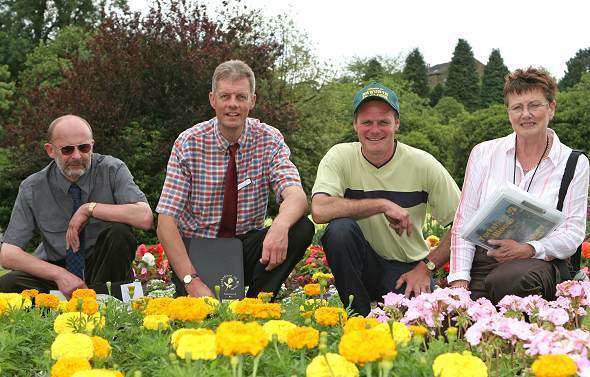 Round two of judging will take place in the summer and the winner of Yorkshire in Bloom announced in September. Jordan Aired was the winner of the competition to design a Haworth in Bloom logo click on the thumbnail for a bigger picture.